Home / Blog / We Do / How Much Does It Cost to Hire a Node.js Developer in Ukraine? How Much Does It Cost to Hire a Node.js Developer in Ukraine? Put simply, Node.js is a fast, light, and modern method of executing network and scalable applications, which makes it one of the most popular web development tools for developers. It is also worth noting that despite its asynchronous and event-driven state, developers can use Node.js with parallel and functional programming by adding some of the libraries built for either one. No wonder, that nowadays, NodeJS developers are in high demand on the market and this popularity is well-versed because of usefulness and multifunctionality of the Node.js framework. Based on the developer survey conducted this year by StackOverflow, Node.js is the most commonly used technology in the world and is the most wanted language that programmers want to develop projects with. From the 2016 User Survey Report conducted by the Node.js Foundation, there are 3.5 million individuals using Node.js worldwide, and this number is growing at 100% rate, annually. Also, 62% of the developer respondents of the survey noted that use Node JS programming works for both frontend and backend project needs. Both studies show that there has been a rapidly growing interest in the use of Node engineering. More and more businesses look for Node JS developers for hire. The graph below shows the trend in the interest on Node.js developers over the last 12 months. According to Clutch.co list, there are 596 software development companies open to requests including Node.js development assistance. When it comes to choosing a Node JS development company to work on your project, firstly you need to figure out if the company has a portfolio, read reviews, ask about the qualification of workers and then compare the received information with what is needed for your project. With this sample and our useful recommendation, you will know what skills and experience to look for. 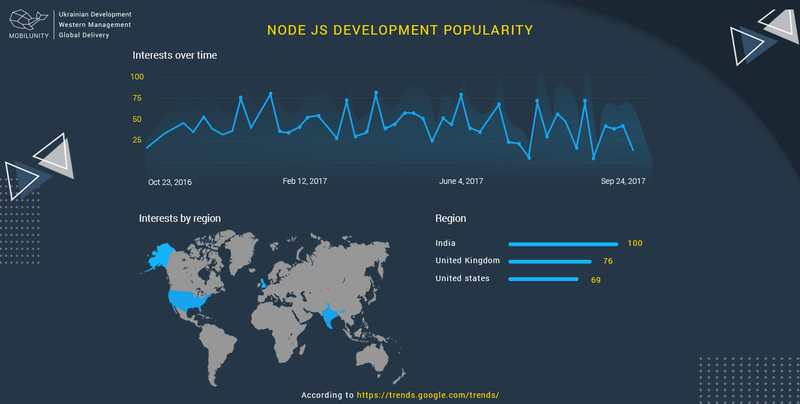 According to Google Trends, the United Kingdom has the highest interest in Node.js developers. Application Programming Interface (API) of Node.JS framework changes at frequent intervals and, therefore, cannot be considered stable one. In comparison to other frameworks, Node.js doesn’t provide a wide range of libraries available. Nevertheless, all common libraries can work for it greatly. asynchronous programming mode algorithm to keep in mind. It is important to develop and implement solid design patterns to make the framework work for your needs according to the prescribed workflow. To make Node.js development even more streamlined, the framework was divided into different sub-frameworks to target different needs and requirements. Here is a short overview of the most popular Node.js frameworks such as Express.js, Sails.js, Loopback, etc. Each framework has its advantages and disadvantages as well as main characteristics that will help you to understand what it can be used for. Express.js is the most popular Node.js. framework presented in 2010. It became a great foundation for many other Node.js frameworks developed later. Being a minimalistic, easy-to-use and simple in terms of features, Express.js doesn’t offer many options for programmers but provides many modules to build applications on. This flexible framework is used for large-scale apps where a long-term support with constant extensions is needed. Main features: quick, easy to use, flexible. Based on Express.js, this framework was developed as a complete product that can be used for fast app development. Sails.js is especially helpful for building and supporting real-time apps that need fast responses and should work with any front end. Main features: complete, easy to develop, usually used for real-time apps. This full-package Node.js framework is extremely helpful in creating real-time scalable web applications for any device (iOS, Android, web). Meteor coders can complete more tasks using less code. Meteor can be used for launching small or big projects aimed to work on all general platforms. Main features: full-stack, time-saving, for general purposes. Loopback is well-known for being a highly extensible modular framework that can create API easily. Loopback supports running applications on-premises or in the cloud and works great when user’s authentication and authorization are needed. Main features: simple, many additional features, used for complex integrations. Hapi appeared in 2011 bases on Express.js as many other frameworks and developed into a solution with another approach: this framework provides the most additional options for development needs. It is helpful for big projects and large development teams and probably will be too complicated for small applications. Main features: configuration-oriented, solid, time-saving, reusable app logic, used for big projects. This new-generation framework is a lighter and more flexible version of Express that was developed mostly for application building. It can be used both for small tasks and big projects and offers a nice bunch of customization options. Main features: quick to develop, reliable app basis, flexible. There are numerous ways of using Node.js. A great Node.js developer can either use it to build from the ground up or integrate it into existing code with the goal of improving it. 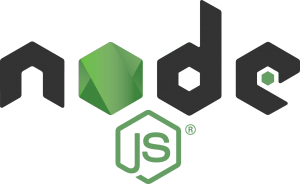 The increased interest in Node engineering can be seen from small startups and international corporations, and a testament to its usability and efficiency proves that Node JS programming can contribute significantly to your current or future development projects. Below are some of the companies that have benefited from integrating Node.js development services into their environment. 40% fewer additional files used. A business and career-oriented social networking website, LinkedIn uses Node.js to streamline and manage their server-side services and application. Similar to Paypal, with Node.js LinkedIn’s development and the application performance increased and the resources needed were reduced. better performance and more headroom resources. Being the largest online video streaming platform, Netflix has millions of users and goes through so much traffic. Netflix uses Node JS web development capabilities for the entire user interface on the website. And with this, they were able to decrease build time while at the same time increasing the customization capability of the website. more user-friendly and customized application to meet all needs. Uber is one of the biggest American online transportation network companies that provides its services to over 60 countries worldwide. With its asynchronous event-driven processing, NodeJS programming addresses tasks of processing a big amount of information from numerous sources at different times at the quickest possible time as well as deals with errors on the fly, improving the code along the way. a lot of new features developed day by day. With today’s numerous ways to communicate, it is possible to find and hire Node.js developer quickly. But what is more important, if you want to find Node.js professional programmer, you will have to spend some time researching the market. There are Node.js development companies offering a wide range of services as well as individual Node.js coders that specialize in particular areas of using Node.js framework. Depending on your needs, the size of the project and the timeframe for its creation, you can find a good Junior Node JS developer for a small task and a team of well-qualified Node JS programmers to realize a big complex project shortly. The most traditional way of finding Node JS developers for hire is to look for them locally, in your region or country. But with the ability to communicate worldwide, more and more companies tend to outsource development tasks, and Node.js development services can be performed remotely without problems. By considering hiring a freelance Node.js developer, you can explore a larger pool of highly qualified professional developers that can collaborate with you on your development project. How Much Would it Cost to Hire Node JS Programming Specialist? It is worth mentioning that the rates differ not because of an experience and qualification of the developer Node.js. It is the difference in currencies that makes the rates so scattered; however, when it comes to outsourcing Node.js development services, programmers from countries with lower rates can build a remarkable project at affordable costs. From the numbers listed above, hiring a remote Node js developer from Ukraine would be the most cost-efficient and more practical choice. There is indeed a high demand for Node developers in Ukraine, since our team receives requests to build dev teams with Node skills as a must monthly. Thanks to our recruiting approaches developed within years, we always know how to show our client's project in the best light and compile correct screening questions for each specific customer. It is not new that fast and highly responsive applications capable of processing tons of data are now becoming the new standard for optimal web and mobile applications and Node.js web application development take the lead in it. So far you have read what Node.js is and how advantageous it will be to hire Node JS developers to work with your development team. There is a vast number of Node.js developers for hire for your development project; however, you need to understand whether you need for one expert or a dedicated team of developers. If you need a person proficient in Node JS app development to join your team of specialists and bring fresh ideas and new approaches to your project, a freelance programmer will fit your needs best. In case you need to develop a project from scratch, you have an idea but don’t know specialties and functions of Node.js framework, it is worth to find a qualified Node JS development company to build your project from scratch and provide any additional services per your request. What is more, a Node company with a library of knowledge and a bunch of successfully developed projects probably has more experienced programmers to create a project exactly how you see it. When it comes to an individual specialist in Node.js framework, he may not be as skilled as a Node JS development company with its overall experience in the field. With Mobilunity, you can be assured that all our developers have been vetted and are highly recommended. Our company offers quality and dedicated work at an affordable price; we will provide you with CVs of our Node programming specialists so that you choose which developer fits the best to collaborate with you in improving and optimizing your website at a manageable cost. If you are looking for a reliable Node.js development company and a dedicated team of professionals to hire remotely, collaborate with you on streamlining your development processes as well as optimizing your website. Mobilunity can provide you with a top-quality assistance in Node.js development with our diverse pool of highly experienced professional developers! Does Mobilunity Provide Node.js Development Services? Founded in 2010, Mobilunity has a huge package of experience in assisting development teams and developing projects from the ground up. We have a big number of happy clients in different corners of the world. With nearly 20 dedicated teams working on various projects for our customers worldwide, Mobilunity receives over 10 requests monthly from people meeting some technical issues, and we are extremely glad to assist them or provide devs. Being located in Kyiv, Ukraine, we don’t have any problems with finding a well-educated and proficient programmer even with the knowledge of a very rare and complicated technology. 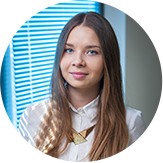 Ukraine is known for having the greatest amount of various developers, who provide a high-quality work. Get in touch with us and we will find a perfect solution for you, too! If you are interested in hiring a Node.js developer to contribute to your project, feel free to get in touch with Mobilunity team. How Much Does it Cost to Build a Mobile App for Events?